TRIPOLI, Libya - An autopsy confirmed that Libyan dictator Muammar Qaddafi died from a gunshot to the head, the country's chief pathologist said Sunday, just hours before Libya's new leaders were to declare liberation and a formal end to an eight-month civil war to topple the longtime ruler's regime. 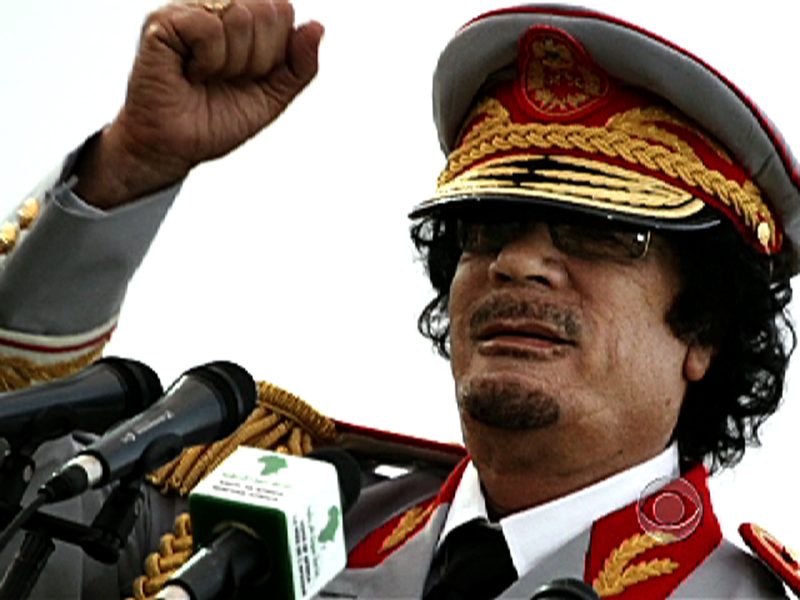 However, international concern about the circumstances of Qaddafi's death and indecision over what to do with his remains overshadowed what was to be a joyful day. Qaddafi's body has been on public display in a commercial freezer in a shopping center in the port city of Misrata, which suffered from a bloody siege by regime forces during the spring. The 69-year-old was captured wounded, but alive Thursday in his hometown of Sirte as it became the last city to fall to revolutionary forces. Bloody images of Qaddafi being taunted and beaten by his captors have raised questions about whether he was killed in crossfire as suggested by government officials or deliberately executed. An autopsy completed Sunday in Misrata showed that Qaddafi was killed by a shot to the head, said Libya's chief pathologist, Dr. Othman al-Zintani. He would not disclose further details or elaborate on Qaddafi's final moments, saying he would first deliver a full report to the attorney general. Most Libyans weren't concerned about the circumstances of the hated leader's death, but rather were relieved the country's ruler of 42 years was gone, clearing the way for a new beginning. "If he (Qaddafi) was taken to court, this would create more chaos, and would encourage his supporters," said Salah Zlitni, 31, who owns a pizza parlor in downtown Tripoli. "Now it's over." Libya's interim leaders are to formally declare later Sunday that the country has been liberated. The ceremony is to take place in the eastern city of Benghazi, the revolution's birthplace. The uprising against the Qaddafi regime erupted in February, as part of anti-government revolts spreading across the Middle East. Neighboring Tunisia, which set off the so-called Arab Spring with mass protests nearly a year ago, has taken the biggest step on the path to democracy, voting for a new assembly Sunday in its first truly free elections. Egypt, which has struggled with continued unrest, is next with parliamentary elections slated for November. Libya's struggle has been the bloodiest so far in the region. Mass protests quickly turned into a civil war that killed thousands and paralyzed the country for the past eight months. Even after revolutionary forces captured the capital Tripoli in late August, a fugitive Qaddafi and his supporters fought back fiercely from three regime strongholds. Qaddafi's hometown of Sirte was the last to fall last week, but Qaddafi's son and one-time heir apparent, Seif al-Islam, apparently escaped with some of his supporters. Jibril told the British Broadcasting Corp. in comments to be broadcast Sunday that "at the personal level I wish (Qaddafi) was alive" so he could face questions from the Libyan people buckling under decades of his harsh rule. Jibril said he would not oppose a full investigation under international supervision into Qaddafi's death.